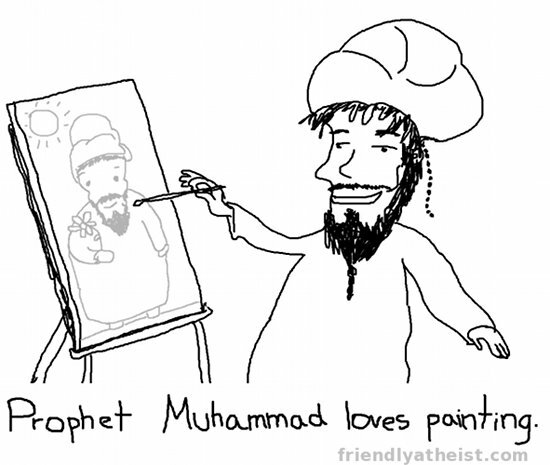 Home >Forums > Religion > Happy Draw Muhammad Day!!! I actually drew one we just can't add attachments on here otherwise I'd post it. You can post a link to your picture of Muhammad in your DDO photos. Wallstreetatheist, you have zero respect for other religions. Don't you know that you can hurt many Muslims here by this? Or was that your intention? I myself cannot care less. However, I find this really sad, and that people like you do such pathetic things. Explain your puerile fatuity that has its roots in "Thou shalt make no graven images." Perhaps he has a retarded view of the life of the Prophet. That seems certain. I'm more than willing to crush his arguments in a debate anyway. (Particularly the paedophilia part). Wallstreetatheist, you have zero respect for other religions. Don't you know that you can hurt many Muslims here by this? Or was that your intention? I myself cannot care less. However, I find this really sad, and that people like you do such pathetic things. Bronze-age stupidity flaring up again on the Internet. How cute! O-/-< Look! It's Muhammad again! We must retaliate! Let's start burning cars and protesting like sub-literate cretins! Other than that, there's no need to overreact to things like this. I used to take a hard stance on it, now I almost don't care. For one, it's pointless. Two, it happens with all religions - Jesus is probably the most ridiculed holy figure in the wold, which doesn't do good to Christianity. Third, there were worse things that were said during the era of the Prophet, such as that he is a madman and whatnot. The responses were "Peace be with you." However, I can't help but lose respect to people who do things like this. Shows something about their intellect. What is your opinion on the entire matter, do you think it is a violation of free speech? Also, why should one respect another person's attempt to censor them. After all, that's what is being challenged here. I made one of these last year and it was pretty hilarious and explicit. But I have different feelings this time around. Drawing Muhammad (peace and blessings be upon him) has to be completely banned because it isn't free speech, it is hate speech. 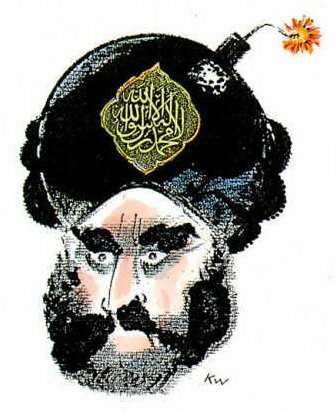 Just as anyone would be socially and most times legally ostracized for making fun of the holocaust so to should any drawing of Muhammad (peace and blessings be upon him) be completely condemned and banned. Did I say that it was a bad thing? Moreover, since you are asking if it is a bad thing, do you think its a good thing to disrespect other religions? Anyway, as Mirza said, this whole thing is just pointless and waste of time, so I'm not going to talk here anymore. I also have to go anyway. And wallsthreetatheist, you should know that you are only making yourself look bad, and this whole thing really says much about you. In the US pretty much everything is free speech including hate speech. One can also make fun of the holocaust with absolutely no consequence legally. I've already said a few comments ago that I don't agree with the spirit of 'Draw Muhammad day' because I don't see the point, and it seems intended to antagonize. But I am going to stand by the spirit of freedom of speech no matter how many people are offended. It seems like religion can dish it out, but it can't take it, like a street thug who calls the police when his victims fight back. Being an atheist or secularist today is no longer a matter of opting out, but actively fending off, so I say whatever abuse religion gets, it deserves 10x over. Besides, I don't think it's possible to be too aggressive when defending freedom of speech, which is absolutely sacred and much, much more sacred than any god, or prophet, or scripture could or will ever be for eternity. I'm don't respect misogyny and sexism; I'm extremely intolerant of them; I hope that doesn't offend. Racism and anti-semitism, sorry no tolerance or respect there. Homophobia perhaps? Nope, not a shred of tolerance there, sorry if that offends you. Child abuse and cruelty to animals? Sorry, no tolerance whatsoever. Slavery? Not a chance of respect for that. But brace yourself, not only am I openly intolerant of all those things, but if religion is used an excuse for any of them, I'm afraid I become aggressively hostile and I don't apologize for it, because I have no need to apologize for it, and neither should anyone else. 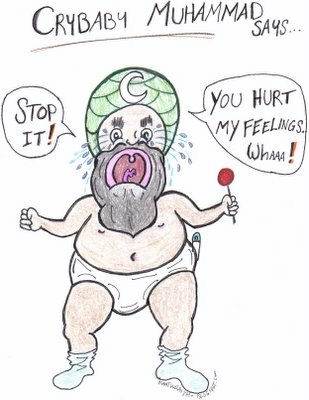 Draw Muhammad Day is a push to crowbar the tiny minds of people's cowardly religious immaturity out of the bronze age and a defense of freedom of speech and freedom of thought. This would never work. We have no certain way of determining what kind of speech goes over reasonable lines. I think freedom of speech should remain strong. That's a joke. Anyone who even questions the number of people killed on the holocaust on a public level are completely condemned socially and it is completely taboo, legal actions are also taken. 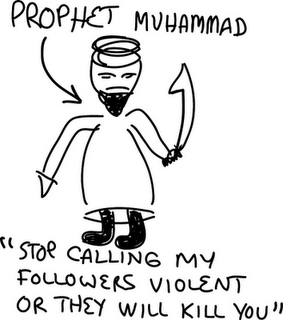 However, if one draws Muhammad (peace and blessings be upon him) the fake guise of free speech is put up. Double standards. 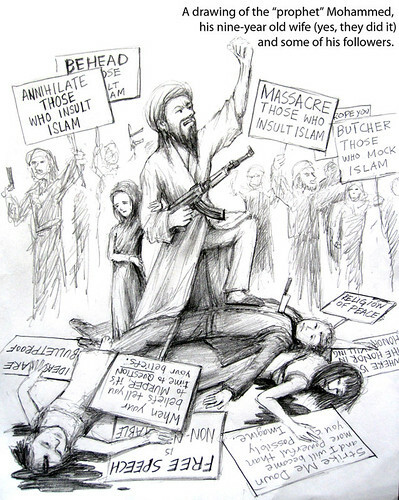 Drawing a picture of Muhammad isn't hate speech; it's a violation of Islamic blasphemy laws. The intention is to assert that people can draw whatever they want. The intention is to assert the principles of secularism and freedom. People have to understand that true free speech doesnot actually exist. There are certain lines one cannot cross and if they do, they suffer consequences. Things such as heavy criticism of government policy, holocause, racism are simply not allowed. complete free speech doesn't even exist just as true democracy doesn't.